Many people suffer from back pain when bending forward without knowing why. They usually also feel back pain when standing or sitting for an extended period. X-rays and MRI’s don’t show anything. Specifically, that can cause your pain. And even if they do show something, it doesn’t say that that is the cause of the pain you’re feeling. But I found a way to treat people with precisely this problem. And here I’m going to show you how you can do the same too with just a few exercises. A recent study shows that by doing back pain exercises regularly, you can prevent back pain coming back in the future. I can even let you feel the same thing in your hand when you move it like you’re bending your back. And your hand isn’t damaged is it? But first I’ll teach you what the MRI findings mean and also why you feel pain when moving your back. So this and a lot more is what you will learn today. First I’ll start by explaining the anatomy of your back and what kind of MRI findings you can have and what they are. Your lower back consists of 5 vertebrae. Every vertebra connects to the one on top of it through joints on either side of the vertebrae. These are called the facet joints. The facet joints provide the majority of the mobility of your spine. They are covered with cartilage to increase mobility further. 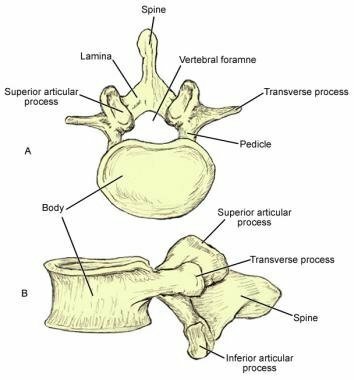 As you can see on the picture the upper part of the vertebrae, the superior articular process faces upwards where the inferior articular process faces downwards. These two parts form the intervertebral foramen. The intervertebral foramen is the place where your nerves leave your back. Between 2 vertebrae your intervertebral disc is located. The function of this disc is shock absorption to relieve your vertebrae. They also provide flexibility of your spine. Your intervertebral disc consists of a hard outer layer and a soft inner layer. Furthermore, your spine is covered by ligaments to increase stability. There are also small muscles that run from vertebra to vertebra to keep your back stable. These are called the multifidus muscles. The bigger muscles that cover your back are designed to move your back and help you to lift things. We know that when you get older, your back will degenerate. This degeneration starts already in your early 20’s and increases with age. Degeneration is a very normal process and doesn’t have to be a cause for your pain. A lot of you have probably heard a lot of medical terms regarding your lower back. In the next chapter, I’ll explain to you the meaning of these medical terms, and I’ll show you also a recent study about this matter and that there is a reasonable chance that these findings are unrelated to your chronic back pain. When you’ve had an MRI done of your back trying to find the cause of your lower back pain, you’ve probably heard that they found a lot of minor degenerations in your back. I’ll explain to you what these degenerations mean, but first I want to discuss a recent study with you concerning the relationship between MRI findings and lower back pain. In this study the scanned the back of 3110 people without back pain. As you can see, the degenerative changes they found in your back are also often present in people without back pain. This contradiction raises the question if these MRI findings have any value. The answer is no, or at least not directly. But before I teach you the real problem with the solution, I’ll explain to you first what these degenerative changes mean and what their impact is. Disc Degeneration: Is a natural aging process where your disc holds less water, reducing its flexibility. Disc signal loss: Is the same as disc degeneration. Disc height loss: Because of less water in the disc it losses his volume. Disc bulge: A disc that is pushed a little bit outside of his normal position. Disc protrusion: Is a disc bulge which is pushed out more. Annular fissure: Degeneration of the outer side of your intervertebral disc. Facet degeneration: Loss of cartilage covering the facet joints. Spondylolisthesis: Sliding forward of a part of your spine due to degeneration. All these findings don’t cause any problem as long as they don’t compress a nerve for a long time. When this is the case, you’ll feel the familiar sensation of radiation in your leg, all the way to your feet. You will also notice that it feels different when you touch your leg and even some loss of strength in the affected limb. The compression of a nerve by your intervertebral disk is called a herniated disc with radiculopathy. You can find the treatment for this here. So know you know that the MRI findings are not helping you any further; it’s time to explain to you what is causing the lower back pain when bending forward. Lower back pain when bending often follows after several episodes of acute low back pain or throwing out your back. What happens is that you feel a sudden sharp pain in your back when bending forward. A muscle strain is often the cause of this sudden sharp pain — the damage recovers within a few days or weeks. But when this happens several times a year, you will want to prevent this from happening. Many people do this by bracing their back. They extend their back by flexing the back muscles to keep the spine straight. They believe that flexing your back is bad for you and can cause back pain and eventually a herniated disc. But study’s show that bending is not a risk factor for getting back pain or a herniated disc. The only risk factor for getting back pain is previous back pain. For a herniated disc it is heavy work combined with a lot of bending and twisting of the back. So bracing your back is not going to help you prevent back pain. These muscles are not made for this task. They become sore very quickly and can’t perform this task anymore. Your body gives you a warning by letting you feel pain. The pain is not a signal of an injury, but a sign telling not to do that or an injury will appear eventually. Pain is often a warning signal to prevent damage. And I can let you feel this in your hand. Try to bend your hand when it is relaxed. Now make a firm fist for me and try to bend your wrist while maintaining this firm fist. But does that mean that your hand is damaged or weak? No, your muscles don’t like to stretch during a contraction. So your body tells you not to do that. And that is what people do with back pain when bending forward. They try to bend forward with their back muscles contract, which hurts. And it causes some other problems too. Because you’re using the big muscles in your back so much, the multifidus muscles that should stabilize your back become lazy. They react too late when you bend forward. The result can be a sudden sharp pain in your back. So instead of preventing it, you will facilitate it and make it worse. And this will cause some other problems as well. I think that this belief comes from a study that looked at flexing the spine and what happened with the intervertebral disc. In this study, it showed that flexing the spine caused a herniated disc eventually. But what they did was flexing the spine 80.000 times at a rate of 1 time per second. When you bend your arm for 80.000 times at a rate of 1 time per second, you will tear your arm muscles for sure. But that doesn’t mean that flexing it is going to hurt you. Your body is well capable of restoring any inflicted damage. The same happens when working out. The muscle ache you feel after is damage to your muscles. But what your body does is make them stronger after that to, prevent any damage happening in the future. I don’t know if this also works for your intervertebral disc, but I’m positive that it doesn’t cause back pain or a herniated disc. Another study showed that elite athletes that bend a lot like cross–country skiers don’t have a more significant change on back pain than people that don’t. So once again, bending your back is not dangerous and doesn’t cause back pain. So let’s continue in discovering how you can bend your back without pain. When you’re sitting on a chair or your couch, you can also experience back pain. Problems with the multifidus muscles cause this pain in your back. Because when you never use them, they become exhausted very quickly. And when you’re sitting, they have to work for a long time. When they can’t do this, they will get sore which results in pain. This can also result in back pain when standing. When you’re standing, these multifidus muscles also have to work to keep your back stable. When you’re standing, you’re always wobbling forward and backward. When your standing with your back muscles contracted, this will result in pain very quickly. This usually happens when keeping your back extended to much. This occurs mainly in a very flexible woman. They tend to extend their knees and ‘hang forward’. What happens is that your back is extended completely causing compression of your vertebrae’s. It also switches off the stabilizing muscles in your back. This often results in back pain and can also be a cause for neck pain and headaches. The last common cause of back pain is when you get up from bending. Bending forward is usually not the problem, but now it is getting up again. And when you’re standing again, the pain is gone as well. What happens here is that you got a muscle strain which isn’t recovered yet. This can be either the small stabilizing muscle or the large strength muscle. Either way, when you train these muscles for a while, the pain will disappear without a problem. So now you know the cause for most back pain related movements and positions it’s time to do something about it. To cure your back pain when bending forward, sitting or standing we’ll have to do a few activities. The first exercise will teach you how you can bend forward without keeping your back straight. The other exercises will teach you how to keep a stable posture to prevent back pain and two exercises to increase the strength and reaction speed of your back muscles. When bending forward, you have to unlearn to keep your muscles contracted. This will be difficult and especially scary at first. But when you do it often, it will get easier and more comfortable. You can see the steps in the picture below. You will notice that you can bend a lot further then you thought you could, and it doesn’t hurt. It will be scary for a while, but when you do it several times a day and try to bend further every time, you will notice that it becomes much more comfortable over time. This way you can bend forward without having pain. Make sure that you bend this way every time you pick something up. Because you’ve moved with a stiff back for so many times, you do it more often then you think. So first do everything very consciously to make sure you do it the right way. This means picking up your shoes, your kid or a shopping back like this. Also getting up out of your chair should be done by leaning forward and flexing your back. Eventually, you will be able to bend forward without back pain again. The second exercise is designed to improve your posture. Poor posture might be a cause of persisting back pain. Many people with back pain, especially woman tend to overstretch their knees to create a passive posture. It feels easier to stand this way. But this results in overstretching your lower back. And the spot where it is extended the most is always the most painful spot. 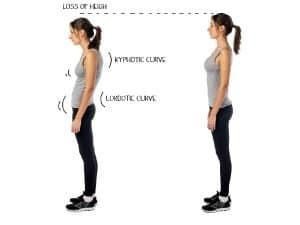 But there is an easy exercise to improve your posture to reduce the pain in your back when standing. Stretch out your chest and neck a little bit. At first, it will feel very weird standing like this. This is because your joints contain little sensors to monitor the angle of the joint. Your body has a normal angle for each joint. This is known as the normal position. So when you change your position, this feels weird. But when you train this every day, your body will consider this new position as the normal position. This is when it doesn’t feel weird anymore. You will also notice that at first, you will get muscle soreness in your upper leg muscles and your lower back. This happens because you’ve got muscles working that haven’t worked for a long time. So additionally we’re going to train these muscles in your back as well. The third exercise is designed to increase the endurance and reaction time of your multifidus muscle. As I told you before, these muscles are essential in preventing back pain and throwing out your back. They’ll keep your back stable when bending forward, so nothing happens. But when you have poor posture or keep your back extended these muscles become lazy and weak. This way they react too late or get sore very quickly when you’re standing or moving. This shows that this exercise is essential. When the endurance increases you will notice that the back pain when standing and sleeping reduces. Also bending forward will become easier. Now we have one final exercise left to increase the strength of the big back muscles. When you’re standing and moving with your back always fully extended you’re overusing the big muscles in your back. Not only does this cause pain but it also damages the tissues because they don’t get any rest. This results in less strength in your lower back muscles which makes lifting more difficult. Try to come up as high as you can. At first, it will be difficult to come up, but when you keep doing it, you will notice that it becomes more comfortable every time. You can increase the number of repetitions to get even stronger. 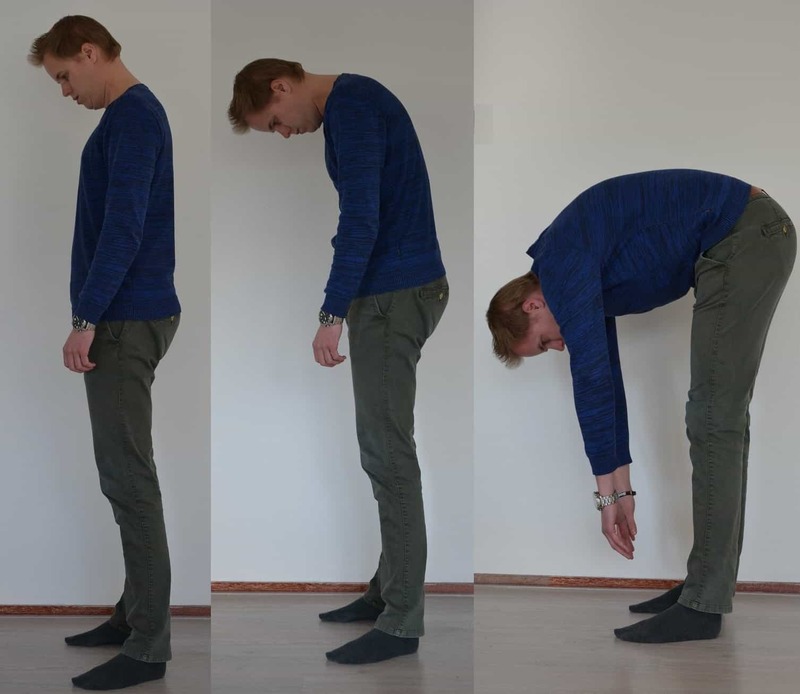 As you can see, there is a lot you can do about back pain when bending forward, standing or laying down. So keep doing your best to perform the exercises described above to solve your back pain, even after many years. If you have any question left feel free to send me an e-mail.